We’ve included most of the reports that you’re going to need straight out of the box.Need one that’s not there? No worries, we can build it for you in the Custom Reports section. Widget’s can be moved around the dashboard or removed if needed. Report’s should give you the information that you want straight up. They shouldn’t be a maze of data that requires sorting and searching. We’ve designed our reports so they display the information you want in a way that is easy to understand. 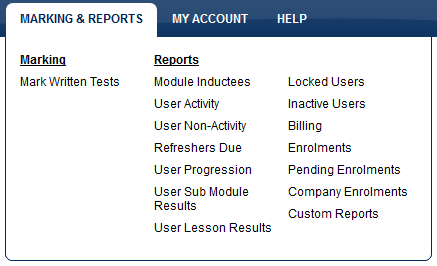 Get in depth analysis of your course and user activity through the progression report. This report allows you to view all active users who have started but not completed a course, highlighting specific modules or lessons that users might be getting stuck on. Reports are rarely used in isolation so it’s important that you can export your data. Zulu LMS gives you the ability to export report data as either .PDF or .CSV (The standard format for data files). This allows you to easily import your training data into other software products. Zulu eLearning gives you the ability to sell courses online via our inbuilt payment gateway. This allows users to purchase courses with a Credit Card or with a voucher key which has been setup. 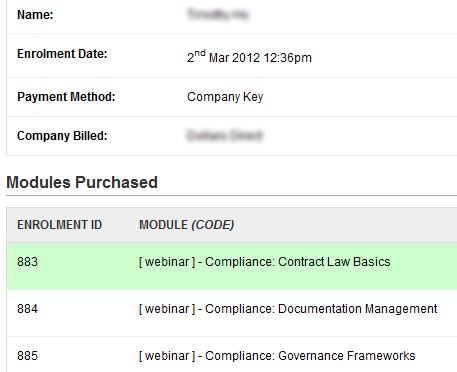 Tracking and managing these course purcahses is easy with our reporting engine.